Fr. a: Large bowl. Wide base ring, folded. Domed(?) bottom; widely flaring lower body. p.W. 0.031, p.H. 0.052, est. Diam. base 0.13 m.
Fr. b/c: Thin-walled beaker. Slightly flaring rim with thickened “matchhead“ lip (fire-polished). Diam. rim ca. 0.08, p.H. 0.013, max. p.dim. 0.012 m.
Fr. d: Domed concave base with series of indentions on underside: pinched out feet? Fr. e: Convex body: globular? Fr. f: Body of uncertain form. Fr. g: Base of small bowl or cup? Fr. h/i: Very thin, concave body: small bottle e.g. unguentarium? Fr. 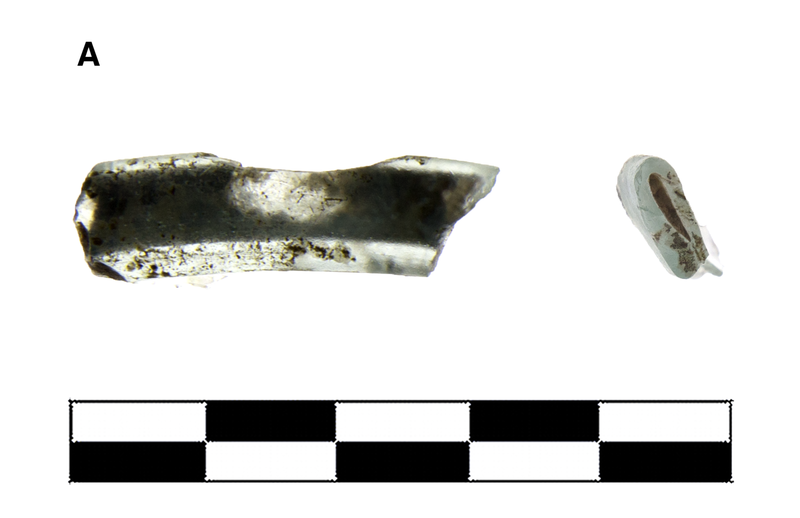 a: Light blue with greenish tinge (PMS 623C), translucent. Very fine material. Fr. b/c: Bluish colorless (PMS 656C and lighter), translucent. Uncommon small, spherical bubbles. Fr. d: Medium to dark yellowish green (PMS 7758/7759C). Frequent small, spherical bubbles. Fr. e: Medium yellowish green (PMS 585C), translucent. Frequent pinprick to small, spherical bubbles. Fr. f: Light yellowish green (PMS 373C), semiopaque. Fr. g: Bluish colorless (PMS 7541C), transparent. Rare, small spherical bubbles. Fr. h/i: Yellowish colorless (PMS 7499C and lighter), transparent. Uncommon pinprick to small, spherical bubbles. 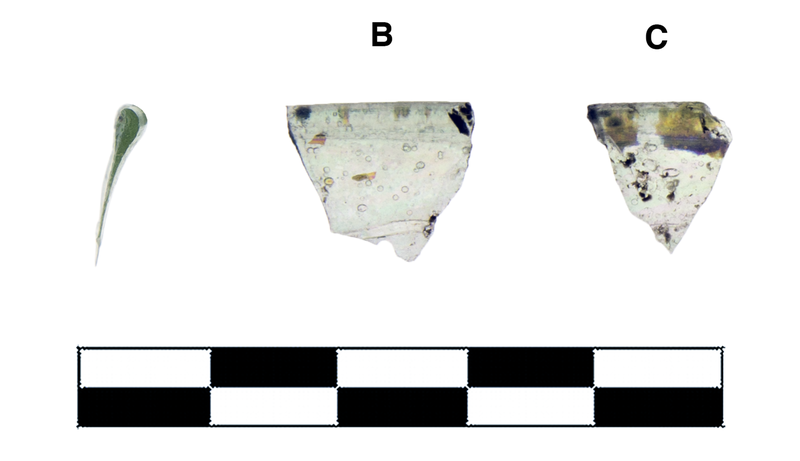 One fragment (a) preserves less than one quarter of base; two very small nonjoining fragments (b/c) preserve less than one quarter of rim; and six separate fragments (d-i) represent different vessels (MNI 4). Fr. a: Extensive milky flaking, slight iridescence, slight pitting, large chipping. Fr. b: Slight, extensive iridescence and pitting. Frs. d-i: variable preservation but mostly slight, sparse irridescence, flaking, and chipping.